The type of cat litter box you choose to buy is just as important as the type of litter. 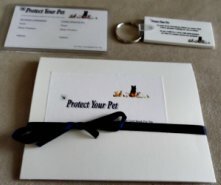 Cat owners know that their feline friends can sometimes be very selective, and will refuse to use an item or a product if it does not meet their standards. When choosing a cat litter box, both the size of the cat,and how many cats will be using the box are some factors that should be considered. There are three main types of litter boxes. Open litter boxes are the most common type,they are plastic and rectangular shaped. Open litter boxes come in many different sizes and depth. 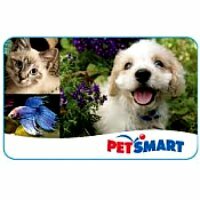 They are easy to find at any pet store or in some department stores in the pet aisle, and are relatively cheap, as little as $6 dollars. Using an open cat litter box is a great way to litter train your kitten, since this type of box is accessible and easy to use. Some cats prefer this type of box, especially if it's the first type their introduced to. However, if you use silica crystals as your cat litter, like we do, when your cat begins their covering ritual, usually after using the litter, the crystals go everywhere, but our always ready broom helps to clean up that problem. Cats, like humans, like their privacy when using the bathroom,so it's important to place an open box in a private area, or at least one of the most private areas in your home. There are several different types of cat litter, to find out the pros and cons of each type read Cat Litter:Which Type Is Best For Your Cat? A Covered cat litter box, is just like the open litter box, but has a hood. The hood then has a door, or just an opening to allow the cat to go in and out of the litter box. Your cat definetely gets more privacy with this type of box, but at the same time it can be a litte castrophobic and intimidating for some cats, especially kittens. The litter boxes that have a flap that close can be even more scary to kittens and some adult cats. Imagine being this kitten stepping into this big box, and then the swinging door closes behind you resulting in darkness , it's frightening me just thinking about it. This type of box is popular amongst cat owners, because there's usually less adour and less tracking of the litter.If your cat is on the larger size, it's important to buy a big covered box, so that your cat can easily move around once they start trying to cover the evidence.Cat litter odour can cause an unpleasant scent in your home and be difficult to get rid of, to find different effective ways to rid your home of that smell read How To Get Rid Of Cat Litter Odor. Covered boxes tend to be a little bit more expensive than the open ones, but you can still get them for around $12 and up. Covered litter boxes also come in designer styles, such as a night stand or end table, where your guest won't even know it's a cat litter box. To find out more about designer cat litter boxes visit cat litter furniture. In recent years self cleaning litter boxes have become more popular, I mean we get it, who doesn't wish their cat could scoop after using the litter? These boxes usually have a motion sensor and motorized raking system that drag the clumped litter into a area where it can be emptied later. Some of these automatic boxes work well and honestly others are just a waste of money. 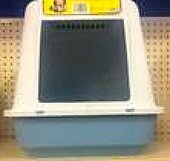 To read reviews on which self cleaning litter boxes are worth buying read Self Cleaning Cat Litter Box Reviews. They are also expensive, you usually have to buy a start up kit and then depending on the type, buy special litter for that machine. The area where the used litter is raked to is usually covered, which helps to keep down the adour. Some cats don't like automatic litter boxes because of the sound the motorized ones make. Although automatic boxes helps to reduce the daily scooping,you still have to empty and wash the box on a regular basis with mst of them. Your cat will essentially be the one to judge if this type of cat litter box is best for your cat, if your cat likes it they will use it, if not they will find a different location in your home to make their litter box. 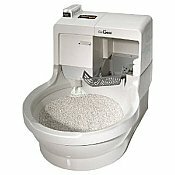 This type of litter box usually works better if you start your cat off using it at a younger age, so that they get used to it. Liners are designed to be placed at the bottom of your cat litter box before pouring in the litter. Liners are basically plastic bags for your cat's litter box with drawstrings. When it's time to change the litter you simple pull the drawstrings and the liner gathers the used litter into the center of the liner, ready for disposal. 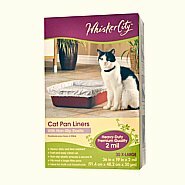 Liners help to make cleaning the litter easier.They cost about $5 for a box of 12 and come in many different sizes to fit your cat's litter box. There are many different brands,so sometimes it requires a little bit of trial and error to find the one that fits your cat's litter box well and is strong enough to handle your cat's claws. The litter helps to protect the liner from getting really damaged from your cat's kneading. We love liners and always use them in our cat's litter box. 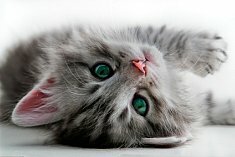 Cat Litter Box Training Made Simple - Step by step instructions on how to teach your kitten or older cat to use their cat litter box. Fresh Step Cat Litter Review -A unbias review of Fresh Step Cat Litter.